October is Domestic Violence Awareness Month. Thanks to the internet and community awareness, you can now find thousands of articles on defining abuse, leaving an abusive relationship, avoiding unhealthy relationships, etc. I want to address this topic but not in the usual way. I don’t know the statistical data, but in my experience many women stay because of misguided spiritual convictions – or at least that is the surface reason. Many women have a deeply held belief that marriage is forever – no matter what. With that core belief it doesn’t take long to sink deeper into the abyss of abuse and lose yourself completely. Susceptible women have told me the Bible tells them not to judge and that he came from a bad childhood, or he has a drinking problem, etc. That’s an important commandment but we have to understand it completely. We cannot judge where a person’s heart is or their motive because we cannot know what’s behind the behavior. But we can and must judge the behavior. And we must protect ourselves and our children from harm. Feelings aren’t right or wrong. Only behavior can be judged that way. “That’s a very complicated question so let’s talk about it. Yes. I do think she’s going to heaven and I will tell you why. I think when we look at your mom’s behaviors, everyone would probably think she’s going straight to hell, but God looks at the heart and He’s the only one who can judge where her heart is. I know she asked Jesus into her heart when she was 8 years old and she was baptized to show she had made that decision. I know when you were little she took you to church and she taught you to pray. And I know there were times in her life when she showed compassion and care for others and she’s done some good things in her life. I also know she has a mental illness that causes her to make bad decisions and her bad decisions hurt other people, especially you. Do you remember King David in the Bible? He made some terrible decisions including murder. Yet, God said David was a man after His own heart. The difference is David was always remorseful and tried to do better. God thought so much of David, that He later sent Jesus through David’s family line. The only thing I know for sure that gives me comfort when I can’t see much hope for a situation is that God is in the redemption business. That means he is going to renew all things. In eternity, He will make the earth the way it was in the Garden of Eden. Everything will be perfect, the way He intended it to be in the first place. He will also redeem people. In Heaven, there won’t be any mental illness or drug use or bad decisions because there won’t be any sin. I believe your mother will be in heaven along with everyone else who doesn’t deny Jesus. I’m not sure you will ever be able to have a relationship with your mother on this earth. But one day we will all be made perfect and God will restore us to our original condition. All our gifts and talents and personalities and good intentions will be fulfilled. You love the Lord and at one time your mother did. I believe we will have all of eternity to get to know her and enjoy her in a way you can’t now. The lesson from that story is this: Hang onto the good memories you have from an abusive person. There are probably lots of them. But don’t allow him or her to hurt you anymore. It doesn’t benefit you or them or anyone else. Domestic violence is a far cry from God’s design for families. Domestic violence is about power and control. Marriage is about mutual submission, sacrifice and partnership. Don’t let misguided spiritual beliefs or erroneous teachings by your church keep you bound to a life of abuse and pain. God’s perspective on abuse is “Get OUT”. Consider a couple of examples of God telling his people to flee. This is an excerpt from Dr. Ralph Wilson’s article. James J. Tissot, ‘David in the Wilderness of Ziph’ (1896-1902) gouache on board, Jewish Museum, New York. Larger Image. Put yourself in David’s sandals for a Put yourself in David’s sandals for a moment. 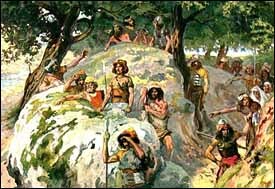 The king whom David honors seeks to kill him. Saul will stop at nothing — even at sacred boundaries! When David seeks sanctuary with Israel’s revered prophet Samuel, Saul no longer fears God. 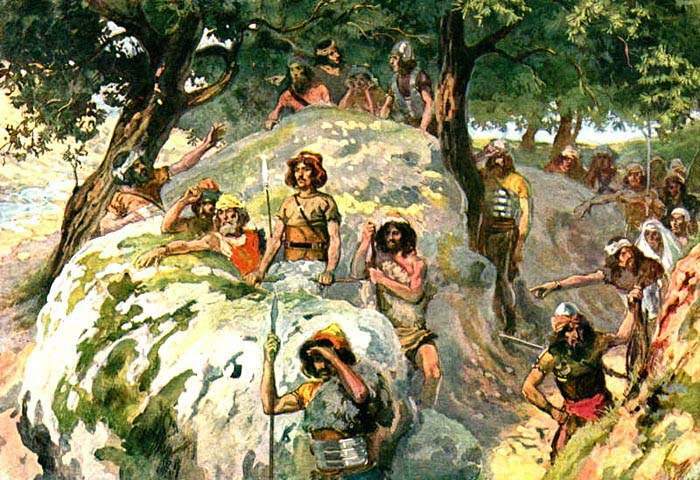 Except for God’s intervention, Saul would have killed David in Samuel’s very home (19:18-24). Jonathan, his dearest friend, can no longer associate with him. In fact, David’s very presence puts others is danger — as we’ll soon see (22:6-19). David is on his own, a fugitive, running for his life. Yes, God will be with him during this time — abundantly — but David is just learning to walk with the Lord. David is desperate and without resources to make an escape. Another example is with Jesus himself. God told his earthly father, Joseph, to travel to Egypt from Bethlehem because King Herod was going to seek to kill Jesus. There were no instructions from God to seek to understand Herod or giving him a chance to do the right thing, etc. None of the excuses we tend to give an abusive person. The Bible is full of instructions on boundaries and treating each other with mutual respect and love. Abuse of power and people is as far from the character of God as the East is from the West. Don’t allow yourself or anyone you know to use God as an excuse to stay in an abusive relationship. Wishing you a life of purpose and promise.